After the major success of his Concerto for Orchestra, premiered in Boston in December 1944, Béla Bartók—who for the past few years had been comparatively neglected in his American exile—began to be showered with commissions for new works, only some of which he was able to fulfil in the ten months that were left to him. One of these was from the leading viola player William Primrose, who had been enormously impressed by a performance of Bartók’s Second Violin Concerto given by Yehudi Menuhin. Some time in late December or early January 1945 (the precise date is uncertain) Primrose suggested to Bartók that he would like to commission a viola concerto from him, and by mid-January the had composer agreed. To what extent he worked on the piece in the first half of 1945 is unclear, as both Bartók and his wife were ill a lot of the time; and in a letter to Primrose drafted on 5 August Bartók said that he had almost despaired of finding ideas until they managed to get a summer break at their house in Saranac Lake. In mid July, however, he had started drafting a concerto with four movements, ‘Each movement … preceded by a (short) recurring introduction (mostly solo of the viola), a kind of ritornello’. This letter, however, was not sent; instead on 8 September Bartók wrote to Primrose to tell him the concerto was ‘ready in draft’ and that he could make a full orchestral score ‘in 5–6 weeks’. Instead, less than a fortnight later Bartók fell gravely ill, and died in the West Side Hospital, New York, on 26 September. Ditta and Peter Bartók gave the materials of both concertos to Tibor Serly, who had been Bartók’s most constant and trusted Hungarian musician-friend in his last years in the USA, ‘to look over these manuscripts carefully’. While he had comparatively little to do to complete the Third Piano Concerto (which was premiered by György Sándor and the Philadelphia Orchestra in February 1946), the elaboration of a performing version of the Viola Concerto was a much more complex undertaking. Primrose (who edited the viola part himself) was able to premiere Serly’s recension of the music only on 2 December 1949, with the Minneapolis Symphony Orchestra conducted by Antal Dorati. Almost immediately it was recognized as one of the major contributions to the small literature of concertos for the viola, and has been a cornerstone of the instrument’s repertoire ever since. 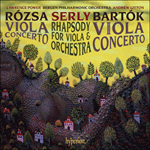 There have been various cavils about Serly’s interpretation of Bartók’s intentions: in 1992 the violist Csaba Erdélyi premiered a new version of his own, while in 1995 Peter Bartók, with the musicologist Paul Neubauer, published a revised edition of the concerto which differs from Serly’s in some important respects. In general, though, it is Serly’s version that continues to hold sway in the concert hall. Serly had talked to Bartók about the concerto in the composer’s New York apartment just before he went into hospital in September 1945. By that time Bartók had abandoned the four-movement design that he had described to Primrose the previous month, suppressing his ideas for a scherzo, to arrive at the three-movement form, with the slow movement joined on to the finale, that we know today. Though Bartók had utilized the entire range of the viola, he had particularly exploited the low and middle registers which give the concerto a distinctively dark colouring. In his last letter to Primrose he had spoken of the ‘highly virtuoso’ aspect of the solo writing, and said the ‘sombre more masculine character’ of the instrument ‘partly influenced the general character of the work’. The soloist is almost continually in the foreground, and a character of eloquent soliloquy—Bartók speaking directly out of his troubled years of exile, perhaps—informs much of the first two movements. The first movement, whose principal key is C (Bartók at this stage in his career tends to write in a mixed mode, combining elements of major and minor), is much the largest of the three and is in a clear sonata form, started off by the solo viola with a cadenza-like introduction that anticipates the first subject. This is a lyrical yet rather stern theme that leaves us in no doubt of the seriousness of the work. A restless, agitated transitional section includes a livelier theme in Romanian style before we arrive at the yearning, melancholic second subject in E, with its falling chromatic profile. The ensuing development fully exploits the bravura possibilities of the viola and culminates in a short cadenza before the return of the opening theme, now heard in horn and flute. The recapitulation presents the various themes in subtly altered forms, and after a fierce orchestral climax the soloist introduces a passionate, recitative-like soliloquy which almost counts as a second cadenza. It ends on a single low C, the instrument’s bottom note, but a solo bassoon enunciates a variant of the first subject that forms a transition to the second movement, which follows without a break. There are no tempo indications in Bartók’s draft, so Serly had to provide them, and the designation of this E minor/major movement as Adagio religioso is therefore his. But Bartók himself had used that description for the slow movement of the Third Piano Concerto, and the Viola Concerto’s second movement has a similarly intimate, devotional tone. It is in a simple ternary form, the outer sections based on a poignantly simple tune closely related to the first movement’s first subject. The central section features the solo viola, high in its register, making a repeated, almost desperate outcry which is marked piangendo (weeping). After the return of the opening section the viola launches into a ferocious cadenza-like effusion, supported by a rough orchestral ostinato, which leads into the finale. Like the slow movement, this Allegro vivace (as Serly termed it) in A is short, but covers a lot of ground through its swift-running motion. It is a kind of rondo whose main theme, mainly in coruscating semiquavers, resembles some sublimated Magyar dance. A somewhat slower episode in a clear C sharp minor has a pawky rustic feeling, and after the return of the rondo-theme the other main episode is a defiantly joyous tune in A major (closely related to the opening theme of the entire concerto, now seen in a more positive light). This leads straight into a reprise of the first episode (now in F sharp) before the return of the rondo theme and a vertiginously brilliant coda in which the solo viola finally makes it to the finishing line, still travelling at full tilt. Après l’immense succès de son Concerto pour orchestre, créé à Boston en décembre 1944, Béla Bartók—dont la musique était relativement négligée depuis quelques années dans son exil américain—a commencé à être submergé de commandes d’œuvres nouvelles, dont il n’a pu réaliser que quelques-unes au cours des dix mois qui lui restaient à vivre. L’une de ces commandes émanait de l’éminent altiste William Primrose, qui avait été très impressionné par une exécution du Second Concerto pour violon de Bartók joué par Yehudi Menuhin. À la fin du mois de décembre ou au début du mois de janvier 1945 (la date précise est incertaine), Primrose a laissé entendre à Bartók qu’il aimerait lui commander un concerto pour alto et, au milieu du mois de janvier, le compositeur a accepté. On ignore dans quelle mesure il a travaillé à cette œuvre au cours des six premiers mois de 1945, car Bartók et sa femme ont tous deux été malades une grande partie de cette période; dans une lettre à Primrose écrite le 5 août, Bartók disait qu’il avait presque perdu l’espoir de trouver des idées jusqu’à ce qu’ils réussissent à prendre des vacances d’été dans leur maison du lac Saranac. Mais, au milieu du mois de juillet, il avait commencé à ébaucher un concerto en quatre mouvements, «chaque mouvement … précédé d’une (courte) introduction récurrente (essentiellement en solo pour l’alto), une sorte de ritournelle». Toutefois, cette lettre n’a pas été envoyée; en fait, le 8 septembre, Bartók a écrit à Primrose pour lui dire que le concerto était «prêt en ébauche» et qu’il pourrait réaliser une grande partition d’orchestre «en cinq à six semaines». Mais, moins de quinze jours plus tard, Bartók est tombé gravement malade et il est mort au West Side Hospital de New York, le 26 septembre. Ditta et Peter Bartók ont confié les matériels des deux concertos à Tibor Serly, qui avait été l’ami musicien hongrois le plus constant et fidèle de Bartók au cours des dernières années passées aux États-Unis, «pour examiner soigneusement ces manuscrits». S’il a eu relativement peu de chose à faire pour compléter le Troisième Concerto pour piano (qui a été créé par György Sándor et l’Orchestre de Philadelphie en février 1946), l’élaboration d’une version jouable du Concerto pour alto était beaucoup plus complexe. Primrose (qui a lui-même édité la partie d’alto) n’a pu créer le texte de cette musique révisé par Serly que le 2 décembre 1949, avec l’Orchestre symphonique de Minneapolis sous la direction d’Antal Dorati. Il a été reconnu presque d’emblée comme l’une des contributions majeures à la littérature restreinte des concertos pour alto et constitue depuis lors une pierre angulaire du répertoire de cet instrument. On a ergoté sur divers points de détails à propos de la façon dont Serly a interprété les intentions de Bartók: en 1992, l’altiste Csaba Erdélyi a créé une nouvelle version de son cru et, en 1995, Peter Bartók a publié, avec le musicologue Paul Neubauer, une version révisée du concerto qui diffère sensiblement de celle de Serly à certains égards. Toutefois, en général, c’est la version de Serly qui reste la plus souvent jouée dans les salles de concert. Serly avait parlé à Bartók de ce concerto dans l’appartement new-yorkais du compositeur juste avant que ce dernier entre à l’hôpital en septembre 1945. À cette époque, Bartók avait renoncé au plan en quatre mouvements qu’il avait décrit à Primrose le mois précédent, supprimant ses idées de scherzo, pour arriver à la forme en trois mouvements que nous connaissons aujourd’hui, avec le mouvement lent qui s’enchaîne sur le finale. Bien que Bartók ait utilisé toute l’étendue de l’alto, il a pleinement exploité ses registres grave et médian, ce qui donne au concerto des couleurs très sombres. Dans sa dernière lettre à Primrose, il parlait de l’aspect «très virtuose» de l’écriture pour l’instrument soliste et disait que le «caractère sombre plus masculin» de l’instrument «avait en partie influencé le caractère général de l’œuvre». Le soliste est presque toujours au premier plan, comme un personnage de soliloque éloquent—Bartók évoquant peut-être directement ses années d’exil agitées—qui guide une grande partie des deux premiers mouvements. Le premier mouvement, dont la tonalité principale est ut (à ce stade de sa carrière, Bartók a tendance à écrire dans un mode mixte, mêlant des éléments de majeur et de mineur) est nettement le plus long des trois; il est clairement écrit en forme sonate et commence sur un solo d’alto avec une introduction comparable à une cadence qui préfigure le premier sujet. C’est un thème lyrique mais assez grave qui ne laisse aucun doute sur le sérieux de l’œuvre. Une transition agitée comporte un thème plus animé de style roumain avant d’arriver au second sujet ardent et mélancolique en mi (majeur/mineur), avec son profil chromatique descendant. Le développement qui suit exploite pleinement les possibilités de bravoure de l’alto et culmine dans une courte cadence avant le retour du thème initial, exposé maintenant au cor et à la flûte. La réexposition présente les divers thèmes sous des formes imperceptiblement modifiées; après un sommet orchestral intense, le soliste se lance dans un soliloque passionné, tel un récitatif, qui équivaut presque à une seconde cadence. Il s’achève sur un unique do grave, la note la plus grave de l’instrument, mais un basson solo énonce une variante du premier sujet formant une transition vers le deuxième mouvement qui s’enchaîne sans interruption. Comme le brouillon de Bartók ne comporte aucune indication de tempo, Serly a dû les choisir et c’est donc lui qui a qualifié ce mouvement en mi mineur/majeur d’Adagio religioso. Mais Bartók lui-même avait utilisé cette description pour le mouvement lent de son Troisième Concerto pour piano, et le deuxième mouvement du Concerto pour alto a un ton aussi intime et recueilli. Il est écrit dans une forme ternaire simple, les sections externes reposant sur une mélodie d’une simplicité poignante étroitement apparentée au premier sujet du premier mouvement. Dans la section centrale, l’alto solo pousse des cris répétés, presque désespérés dans son registre aigu, marqués piangendo (pleurant). Après le retour de la section initiale, l’alto se lance dans des débordements violents, comme une cadence, soutenu par un ostinato orchestral sommaire, qui mène au finale. Comme le mouvement lent, cet Allegro vivace (comme l’a appelé Serly) en la est court, mais parcourt un long chemin au fil de son mouvement rapide. C’est une sorte de rondo dont le thème principal, essentiellement en doubles croches étincelantes, ressemble à une danse magyare sublimée. Un épisode un peu plus lent dans un ut dièse mineur bien clair a un côté champêtre pince-sans-rire; après le retour du thème du rondo, l’autre épisode principal est un air d’une joie provocante en la majeur (étroitement apparenté au thème initial de l’ensemble du concerto, que l’on voit maintenant sous une lumière plus positive). Il mène directement à une reprise du premier épisode (maintenant en fa dièse) avant le retour du thème du rondo, et une coda au brillant vertigineux dans laquelle le solo d’alto file jusqu’à la dernière ligne, toujours à toute vitesse. Nach dem großen Erfolg seines Konzerts für Orchester, das in Boston im Dezember 1944 uraufgeführt wurde, wurde Béla Bartók—der in den Jahren davor in seinem amerikanischen Exil eine eher unbeachtete Existenz geführt hatte—mit Kompositionsaufträgen förmlich überhäuft, die er in seinen letzten zehn Monaten nur zum Teil realisieren konnte. Einer dieser Aufträge stammte von dem führenden Bratschisten William Primrose, der von einer Aufführung des Zweiten Violinkonzerts von Bartók mit Yehudi Menuhin besonders beeindruckt gewesen war. Ende Dezember oder Anfang Januar 1945 (das genaue Datum ist nicht bekannt) äußerte Primrose Bartók gegenüber, dass er bei ihm ein Bratschenkonzert in Auftrag geben wolle—Mitte Januar stimmte der Komponist dem Vorhaben zu. Inwieweit er in der ersten Hälfte des Jahres 1945 an dem Werk arbeitete, ist unklar, da Bartók und seine Frau in der Zeit oft krank waren. In einer Briefskizze an Primrose vom 5. August schrieb Bartók, dass er bei der Suche nach Ideen fast verzweifelt war, bis sie in ihrem Haus in Saranc Lake Sommerurlaub machen konnten. Mitte Juli begann er jedoch damit, ein viersätziges Konzert zu entwerfen, in dem „jedem Satz … eine (kurze) wiederkehrende Einleitung (zumeist als Soli der Bratsche), eine Art Ritornell vorangestellt ist“. Dieser Brief wurde jedoch nicht abgeschickt; stattdessen schrieb Bartók am 8. September an Primrose, dass das Konzert „in Rohfassung fertig“ sei und dass er die vollständige Orchesterpartitur „in 5–6 Wochen“ anfertigen könne. Jedoch erkrankte Bartók zwei Wochen später ernsthaft und starb am 26. September im West Side Hospital in New York. Ditta und Peter Bartók gaben das Material beider Solokonzerte an Tibor Serly weiter, der Bartóks treuster und zuverlässigster ungarischer Musikerfreund während seiner letzten Jahre in Amerika gewesen war, und baten ihn, „diese Manuskripte sorgfältig durchzusehen“. Während Serly vergleichsweise wenig tun musste, um das Dritte Klavierkonzert fertig zu stellen (das im Februar 1946 von György Sándor und dem Philadelphia Orchester uraufgeführt wurde), gestaltete sich die Ausarbeitung des Bratschenkonzerts zu einer praktischen Ausgabe als deutlich komplexer. Primrose (der den Bratschenpart selbst bearbeitete) konnte Serlys Fassung des Konzerts erst am 2. Dezember 1949 uraufführen—er musizierte zusammen mit dem Minneapolis Symphonie-Orchester und Antal Dorati. Das Werk wurde fast unmittelbar darauf als einer der wichtigsten Beiträge zu dem kleinen Korpus an Solokonzerten für die Bratsche anerkannt und ist seitdem ein Eckpfeiler im Repertoire dieses Instruments. Serlys Interpretation ist mehrfach kritisiert worden: 1992 führte der Bratscher Csaba Erdélyi eine neue Version, die er selbst angefertigt hatte, zum ersten Mal auf, während Peter Bartók zusammen mit dem Musikwissenschaftler Paul Neubauer 1995 eine revidierte Fassung des Konzerts herausgab, die sich von derjenigen Serlys in verschiedenen wichtigen Punkten unterscheidet. Im Allgemeinen jedoch wird in Konzerten die Version von Serly aufgeführt. Serly hatte das Konzert mit Bartók in dessen New Yorker Apartment besprochen, kurz bevor Bartók im September 1945 ins Krankenhaus eingewiesen wurde. Zu diesem Zeitpunkt hatte Bartók sich von der viersätzigen Anlage, die er in dem Brief an Primrose einen Monat vorher beschrieben hatte, abgewandt und ließ die Idee eines Scherzos fallen, so dass sich die dreisätzige Form ergab, die wir heute kennen, wobei der langsame Satz direkt in das Finale übergeht. Obwohl Bartók den gesamten Ambitus der Viola zum Einsatz gebracht hatte, hatte er besonders von dem tiefen und mittleren Register des Instruments Gebrauch gemacht, was dem Konzert eine deutlich dunkle Färbung verleiht. In seinem letzten Brief an Primrose war die Rede von „hochvirtuosen“ Solopassagen gewesen, sowie davon, dass der „düstere, maskulinere Charakter“ des Instruments „teilweise den allgemeinen Charakter des Werks“ beeinflusse. Der Solist befindet sich fast durchweg im Vordergrund und das Element des inneren Monologs—vielleicht spricht Bartók hier direkt aus seinen unruhigen Exil-Jahren—prägt die ersten beiden Sätze besonders. Der erste Satz, dessen Haupttonart C ist (Bartók komponiert in dieser Schaffensperiode hauptsächlich in einem gemischten Modus, in dem er Dur- und Mollelemente miteinander verbindet), ist mit Abstand der umfangreichste der drei Sätze und ist in klarer Sonatenhauptsatzform angelegt und beginnt mit einer kadenzartigen Einleitung der Solobratsche, die das erste Thema vorwegnimmt. Es ist dies ein lyrisches und gleichzeitig recht strenges Thema, das keinen Zweifel ob des Ernstes des Werks bestehen lässt. In einem ruhelosen, erregten Übergangsteil erklingt ein lebhafteres Thema in rumänischem Stil, bevor wir bei dem sehnsuchtsvollen, melancholischen zweiten Thema in E ankommen, das ein fallendes chromatisches Profil hat. In der darauffolgenden Durchführung werden die Bravur-Möglichkeiten der Viola voll ausgenutzt; der Höhepunkt erklingt in Form einer kurzen Kadenz bevor das Anfangsthema zurückkehrt, diesmal im Horn und in der Flöte. In der Reprise werden die unterschiedlichen Themen in subtil veränderten Formen präsentiert, und nach einem heftigen orchestralen Höhepunkt erklingt von dem Solisten ein leidenschaftlicher, rezitativartiger innerer Monolog, der fast als zweite Kadenz bezeichnet werden könnte. Er endet auf einem einzelnen tiefen C, dem tiefsten Ton des Instruments, doch spielt ein Solofagott dann eine Variante des ersten Themas, die als Übergang zum zweiten Satz fungiert, der ohne Pause folgt. In Bartóks Skizze finden sich keine Tempoangaben, so dass Serly diese einfügte—die Satzbezeichnung Adagio religioso für diesen Satz in e-Moll, beziehungsweise E-Dur, stammt demnach auch von ihm. Doch Bartók hatte selbst den langsamen Satz seines Dritten Klavierkonzerts so bezeichnet und der zweite Satz des Bratschenkonzerts hat einen ähnlich intimen, andächtigen Ton. Er ist in schlichter, dreisätziger Form angelegt, wobei den Außenteilen eine ergreifend schlichte Melodie zugrunde liegt, die mit dem ersten Thema des ersten Satzes eng verwandt ist. Im Mittelteil erklingt die Solobratsche im hohen Register mit einem wiederholten, fast verzweifelten Aufschrei, der mit piangendo (weinend) überschrieben ist. Nach der Rückkehr des Anfangsteils begibt sich die Viola in eine wilde kadenzartige Passage, die von einem stürmischen Orchester-Ostinato begleitet wird und dann in das Finale leitet. Ebenso wie der langsame Satz ist dieses Allegro vivace (wie Serly den Satz bezeichnete) in A kurz, doch geschieht dank des schnellen Tempos eine Menge. Es handelt sich bei dem Satz um eine Art Rondo, dessen Hauptthema—das hauptsächlich in funkelnden Sechzehntelnoten erklingt—an einen sublimierten magyarischen Tanz erinnert. Eine etwas langsamere Episode in einem klaren cis-Moll sorgt für eine trocken-rustikale Atmosphäre und nach der Rückkehr des Rondo-Themas erklingt die andere Hauptepisode als trotzig-fröhliche Melodie in A-Dur (die eng mit dem Anfangsthema des Konzerts verwandt ist und nun positiver wirkt). Darauf folgt direkt eine Reprise der ersten Episode (nun in Fis), bevor das Rondothema wiederkehrt und eine schwindelerregend brillante Coda erklingt, in der die Solobratsche es endlich mit voller Kraft bis zum Ende schafft.